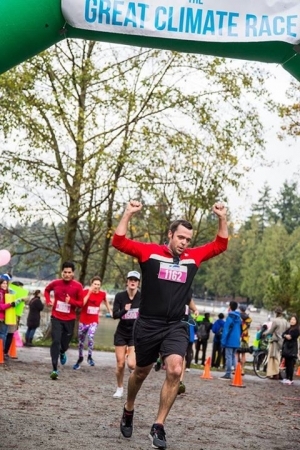 On Sunday, November 8th, some of us at Affinity Bridge were excited to take part in the first inaugural Great Climate Race, both at the Vancouver run and virtually. Mack ran the 10k and broke his own record time in Stanley Park, while I took part in the virtual race from Gibsons BC, keeping things slow and steady in the 2.5k run. We’ve also had the pleasure of helping the Great Climate Race founders, Ben West & Mari McMillan, find the right technical solutions to get this first race to raise money for solar projects off the ground and onto the web. What is the Great Climate Race? A portion of funds raised by the event is going to the Renewable Energy Fund, the non-profit organization established by the creators of the race that aims to fund local solar energy projects. With specific goals and focus, they plan to make a real difference at the local level where tangible results can be seen. "My partner Mari and I founded The Great Climate Race because we see a great opportunity to make a difference. Addressing climate change seems insurmountable but we believe the positivity, compassion and determination of the running community is a force to be reckoned with." The race organizers committed to hosting a zero-waste event. If you’ve been involved in runs before, you’ve probably seen the heaps of garbage left behind at the end of the day; paper cups, errant snack wrappers, plastic water bottles littering the area or piled into garbage cans along the route. Instead of paper cups, organizers encouraged the runners to bring their own bottles of water, offering refill stations on the route. Any food and drinks offered at the event were served in compostable containers. Rather than give a swag bag of printed coupons at the event, they emailed participants virtual coupons or instructions on how to redeem offers from sponsors. And instead of using noisy gas-powered generators, the event was powered by batteries and solar panels, and while I wasn’t there to hear the lack of noise, I can imagine that it was a pleasant change from the norm. How do you run a Virtual Race? The virtual race was a great feature of this event, making it easier to include anyone who wanted to run, even if getting to the physical event or the date and time would otherwise be impossible. When I signed up, I had every intention of running at the event. And then I moved to the Sunshine Coast, and getting to the event became a bigger challenge. Lucky for me, the Virtual Race was one of the participant options! Instead of missing out on the event entirely, I was given the option — through the Virtual Race — to participate on my own schedule and in my own neighbourhood. As a bonus, that meant I got to run with my dog, who is always keen on getting outside. I won’t say I didn’t miss all the hullaballoo that comes with going out to a running event; being part of the community is a lot of fun. But in the name of inclusivity, it was wonderful to still be a part of something bigger. The Virtual Race is what you make it, and since the swag bag was electronic, I still received that too. Why choose the Great Climate Race? Participants had many reasons to sign up for a new race in Vancouver’s rainy autumn season -- all of them united by a wish to make some kind of impact on the problems humanity faces with climate change. I signed up in part because I needed to get back into running after a too-long hiatus, and because I have children and I want to feel as though I’m trying to leave the world for them better than how I inherited it. My background is the environmental non-profit world, where sometimes, after too much conflict, it feels like you’re banging your head into a huge wall of policy, but only seeing the tiniest amounts of progress from your efforts. I was really sold on the idea that the projects being funded were small, on-the-ground, local, and real. For me, contributing to changes that I can reach out and touch is a driving force. I like to be a part — however small — of something tangible and meaningful. We consulted on various combinations of technical options to get the Great Climate Race up and running with the features and functionality that they needed, finally settling on NationBuilder with a custom design and branding provided by Jenn Christenson, (did you know we’re NationBuilder Certified?) and Rallybound. It was a lot of fun to be a part of this project, both on the technical side and as a participant. We're looking forward to taking part in it again next year!